WSU Marching Band performs enthusiastically in the rain at 2017 football game. Photo by Shelly Hanks, WSU Photo Services. 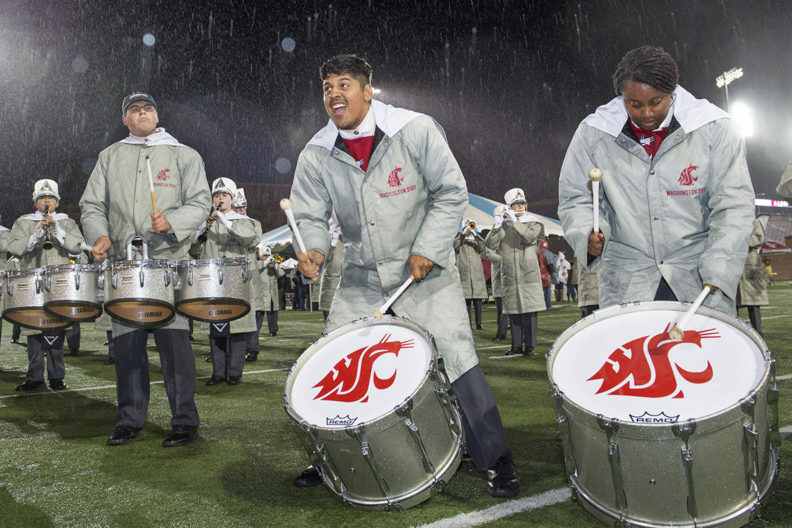 PULLMAN, Wash. – Perhaps the secret to the academic success of the Cougar Marching Band is there are very few secrets. Junior Kevin Kissinger says he instantly gained almost 200 friends when he joined the group as a freshman. That kind of support system helped him stay on track and reach out for help when he needed a hand. While setting the stage for many great moments at Martin Stadium, Beasley Coliseum and Bohler Gym, the Cougar Marching Band members posted an average GPA of 3.23 for the year. Close to half (43 percent) posted GPAs over 3.5, and 31 percent received new or increased scholarships for the upcoming year. The band members face a hectic schedule, especially through the fall semester. Between rehearsals and playing at football games, travel, volleyball games and special events, they may spend 20 to 30 hours some weeks participating in band activities. Many players give up chunks of their fall and winter breaks to play at football games and basketball tournaments. But the time crunch helps to establish priorities. 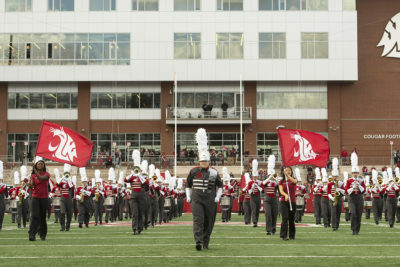 WSU Marching Band during the first half of the Cougars 45-7 win over the Wolf Pack in a nonconference NCAA college football game Sept. 23, 2017, at Martin Stadium. Addy De Marsh wasn’t sure what to expect when she joined the Cougar Marching Band as a freshman last summer. A native of Calgary, Alberta, De Marsh had never seen an American football game. She was hooked after the thrilling victory over USC last fall. Bennefield says just 15 percent of the Cougar Marching Band members are music majors. The rest of the 185 players come from all over the academic spectrum. Kissinger majors in political science and aspires to serve as a judge one day. He says the marching band taught him valuable lessons he would not have learned elsewhere. WSU Marching Band charges onto the field at halftime at 2017 Arizona vs. WSU football game. 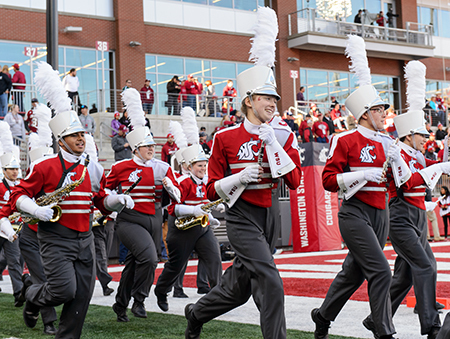 The Cougar Marching Band members receive small stipends for their time, but the true reward is unifying WSU students, alumni and fans wherever they go.